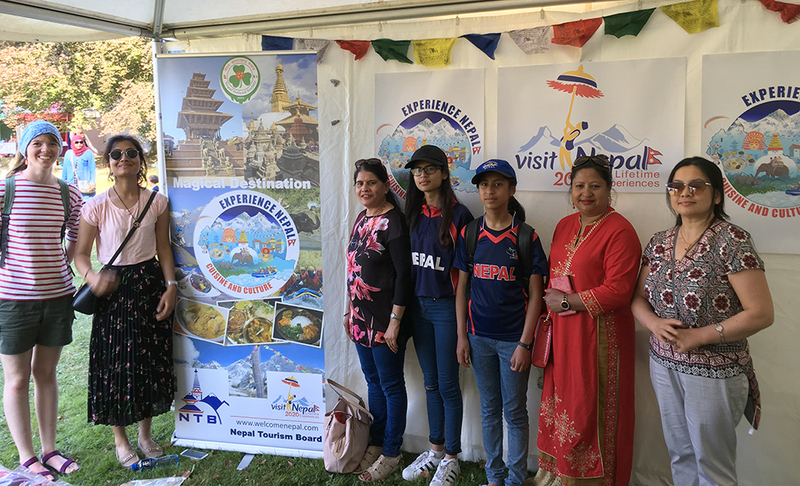 KATHMANDU, July 03: The Nepali community in Ireland has participated in the Flavors of South Dublin Food Festival at Rathfarnham Castle Park, Dublin at the initiation of the Nepal Ireland Society. The event, organized by South Dublin County Council, saw more than 8,000 visitors. Nepal’s handicraft stall was a major attraction, showcasing a huge array of traditional handmade items such as pashmina shawls, lanterns and bags. As part of Nepal Tourism Board’s Experience Nepal – Cuisine and Culture campaign, the stand also served Nepalese Heritage Cuisine - Wo (Lentil Pancake), Aloo Sadeko (Potato Salad), Rajma Simi (Fried Red Kidney beans) and Lamb Chhoyela for tasting. The Nepal team also conducted Nepalese Heritage Cuisine live cooking demonstration. This was done by Mr. Bal Krishna Shrestha, a Nepalese chef who works at the Radisson Blu in Dublin. The fully booked Irish audience keenly observed the preparation of Bara (Lentil Pancakes) and Lamb Chhoyela (Lamb Salad). They were inquisitive and full of praise when the prepared food was served to the audience. NRN-Ireland co-ordinated the cultural performances at the event. Three Nepalese dances were performed on stage in front of thousands of local people. The performances from Nepalese artists were very energetic, the audience were seen dancing along with them, despite the language barrier. The president of Nepal Ireland Society and the Chief Co-ordinator of Experience Nepal – Cuisine and Culture campaign Mr. Deepesh Man Shakya said, “The participation in the food festival was very successful and meaningful. It helped to showcase Nepalese culture, food and handicrafts in Ireland”. Mr. Shakya added the society is planning to participate in similar other events in future to promote Nepal and many wonders that this country holds.